The polychromatic light incident on the grating is dispersed so that each wavelength is reflected from the grating at a slightly different angle. The dispersion arises from the wavefront division and interference of the incident radiation from the periodic structure of the grating. The dispersed light is then re-imaged by the spectrograph and the required wavelength range is directed to a detection system. Gratings consist of equally spaced parallel grooves, formed on a reflective coating and deposited on a substrate. The dispersion and efficiency of a grating are dependant on the distance between adjacent grooves and the groove angle. 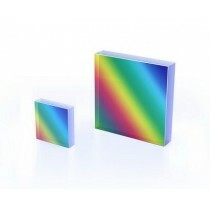 Gratings are generally better than prisms, they are more efficient, they provide a linear dispersion of wavelengths and do not suffer from the absorption effects that prisms have which limits their useful wavelength range. The diagram above shows the orders of the diffracted wavelength. As well as positive orders, light can also be diffracted in the opposite direction (i.e. n = -1, -2 etc.) Higher orders may also appear but these decrease in intensity. Usually the first order lines (n=1 or n=-1) are the most intense.